Tropical Storm Chantal is churning the seas off of the Northeastern U.S. coast. It’s our thrid tropical storm so far in this slow-so-far-hurricane season. Chantal strengthend to a Tropical Storm early Tuesday, but never affected the U.S. mainland. Chantal could bring some healthy squalls to Newfoundland tonight and dissipate in colder waters late in the week. We’ve added a new poll question to our blog! Feel free to vote (only once please) and we’ll give the results of our poll on 13News each night. Wednesday and Thursday: A/C’s a must! We hit the nail on the head when we forecasted a 89° high temperature for Monday. We’ll be a degree or two warmer for Tuesday and a degree or two warmer on Wednesday. No big deal, right? What is more important is the fact that our humidity will come up in a big way during the next 48 hours. Click on the link below for a look at our 13Futurecast model which shows how the humidity will be brought in by the wind. For much of Tuesday, our surface winds (out of the east and northeast) will keep the rich, humid air to the south. Once we go into Wednesday, our surface winds will shift out of the south and tug on that tropical airmass that lies to our south into our area. I know it’s only July, but I officially started my Christmas list! 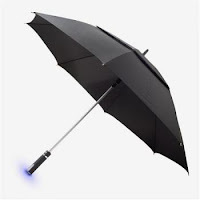 A company has invented an umbrella that doesn’t just keep you dry in a downpour, it actually forecasts the weather! For instance, the handle lights up if there’s going to be rain in the next 12 hours! Get ready to pony up! When the umbrella goes on sale, look for a $125 pricetag. Hard to complain about the heat if you put things in perspective! I just thought I would see how many other people enjoy watching the show. Despite the recent rains the past couple of days, we are still over an inch shy of where we should be for this time of the month. On average, we typically should see 4.10″ of rain for the month of July. So far, we’re just under two and a half inches. The weather pattern we’re going to be getting into for this upcoming week will allow storm systems to bypass us to the north and keep us dry through at least the end of the week. It’s hard to believe that July is almost over with. But just within a few days, August will soon be here. One thing we will surely remember, however, are the great weekends. Every weekend this month was relatively nice. The first weekend was a little hot, but the weekends to follow were fairly comfortable and this one is no exception. Lets hope this nice weekend weather will continue into August! For 78 year old Jan Kenkel, the sky did fall on Thursday morning. 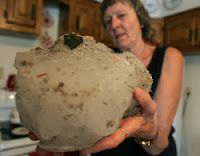 A fifty pound chunk of ice crashed through the roof of her Dubuque, Iowa home! Get the full story from our sister station KWWL-TV. Image courtesy of The Dubuque Times-Herald. They also have a story on it.